You can find the familiar Lyon number plate on metal lockers in virtually every city and town in America. The familiar number plate on each Lyon locker door represents a commitment to both quality and product innovation for generations of students and workers alike. The Lyon Nano Roller latching system is standard on single tier metal school lockers. The patent pending latching system utilizes nano metal roller technology. It provides increased protection against break-ins on Lyon lockers. A locker comes with either a recessed lift handle or a pull handle. This depends on which tier of steel locker you get. Both handle types have a padlock hasp. 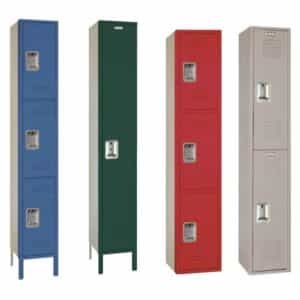 These metal lockers for sale have prime, high grade class 1 mild annealed, cold-rolled steel construction. Door frame corners are lapped and welded of 16 gauge steel to form a strong, rigid assembly. Lyon also fits all steel locker doors on these American lockers with nylon lockbar guides. This reduces clanging as well as provides smooth, quiet use. Lyon has long been America’s leading manufacturer of quality lockers for schools, hospitals, and industry. Wherever you go – either on campus or on the shop floor, in police, fire and municipal buildings, on military bases, in hospitals and nursing homes, or the back rooms of retail stores. Besides standard metal lockers we have other great products. From sports lockers and gym lockers to gear or employee lockers. Contact us today to speak with an expert. We can help you come up with a custom locker solution for you project.